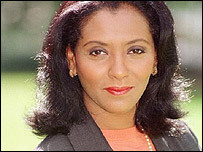 This webpage is dedicated to the BBC News presenter Zeinab Badawi. She is an journalist from Sudan who is a newscaster for the BBC in England who will someday become very famous, but for now, only Brits know about her. She looks a little bit like actress Nichelle Nichols who played Lt.Uhura on the 1960's sci-fi show "Star Trek". Zeinab Badawi often substitutes duties with BBC News presenter Mishal Husain. Zeinab Badawi, a high profile newscaster on channel 4 news in england, had told the media that she intends to purchase a riverboat, load it with medical supplies and sail along the Nile river to some of the hardest hit regions and aid her people. The commentary below does not specifically relate to Zeinab Badawi. This is a commentary on journalism in America.